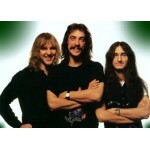 Rush is a Canadian rock band formed in August 1968, in the Willowdale neighbourhood of Toronto, Ontario. The band is composed of bassist, keyboardist, and lead vocalist Geddy Lee, guitarist and backing vocalist Alex Lifeson, and drummer, percussionist and lyricist Neil Peart. The band and its membership went through several re-configurations between 1968 and 1974, achieving their current form when Peart replaced original drummer John Rutsey in July 1974, two weeks before the group's first United States tour. Since the release of the band's self-titled debut album in March 1974, Rush has become known for its musicianship, complex compositions, and eclectic lyrical motifs drawing heavily on science fiction, fantasy, and philosophy. Rush's music style has changed over the years, beginning with blues-inspired heavy metal on their first album, then encompassing hard rock, progressive rock, and a period with heavy use of synthesizers. The band released their latest studio album, Clockwork Angels in June 2012 with a supporting tour that ran from September 2012 to August 2013. Rush has sold 25 million albums in the U.S. for a ranking of 79th.Although total worldwide album sales are not calculated by any single entity, several industry sources estimated Rush's total worldwide album sales at over 40 million units as of 2004. The group has been awarded 24 gold, 14 platinum, and 3 multi-platinum albums. Rush has won several Juno Awards, was inducted into the Canadian Music Hall of Fame in 1994, and inducted into the Rock and Roll Hall of Fame in 2013.Over their careers, the members of Rush have been acknowledged as some of the most proficient players on their respective instruments, with each band member winning numerous awards in magazine readers' polls.